Rooting an Android device means the user gains privileged control over various aspects of the device. The user can overcome the restrictions put by handset manufacturers or network carriers. Rooting allows permission to remove or change system applications, install or run apps which were restricted. There are two types of rooting applications available in the market, such as APK (mobile apps) and PC (softwares). Choose iRoot APK or Not? iRoot APK is a widely used rooting tool for Android with a convenient user interface. It carries out the rooting operation with a single click only. It is a one click solution to root your device. It supports a varied range of Android devices. It can root devices running on Android 2.2 and later versions. You don’t need internet connectivity to root your device with iRoot. It has good accuracy and fast performance. Using iRoot is bit confusing to use for a beginner. This software could possibly interfere with the Bootloader, while rooting an Android device. You can root your Android mobile or tablet with iRoot or any other root APK but the risk of damaging your mobile runs much higher. Choosing the safest bet helps you in the long run. 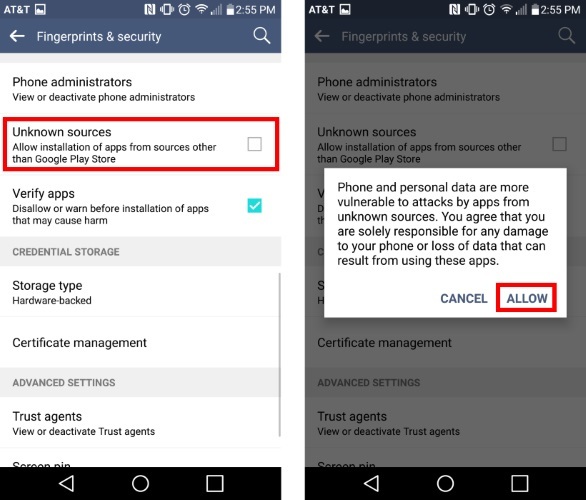 While using an APK, you are exposing your mobile to unknown danger lurking out there like leaking your private data and more. 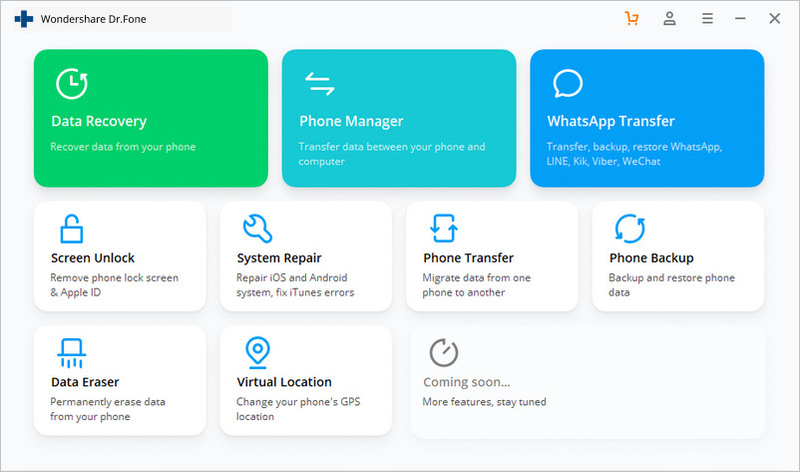 Apart from iRoot APK, there are other reliable options such as dr.fone - Root with better performance. dr.fone - Root is one of the fastest and convenient rooting software that you can avail for free. Though, iRoot APK is also free to use, the dr.fone - Root ranks much better, both in terms of speed and performance. On top of that, it has the highest success rate in the market. dr.fone can be easily downloaded and the rooting feature is available for free. It is absolutely safe to use as it prevents data loss during the rooting operation. It ensures privacy of data while rooting, preventing any data leakage. It is compatible with more than 7000 models of Android devices. It is one of the simplest rooting programs to use, which requires just few clicks. 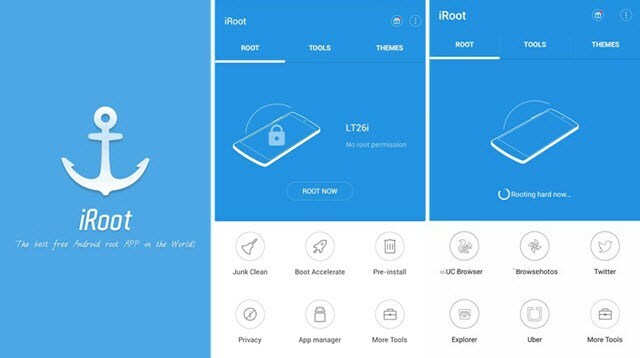 It is the most secure and easy to use rooting program compared to iRoot APK download. 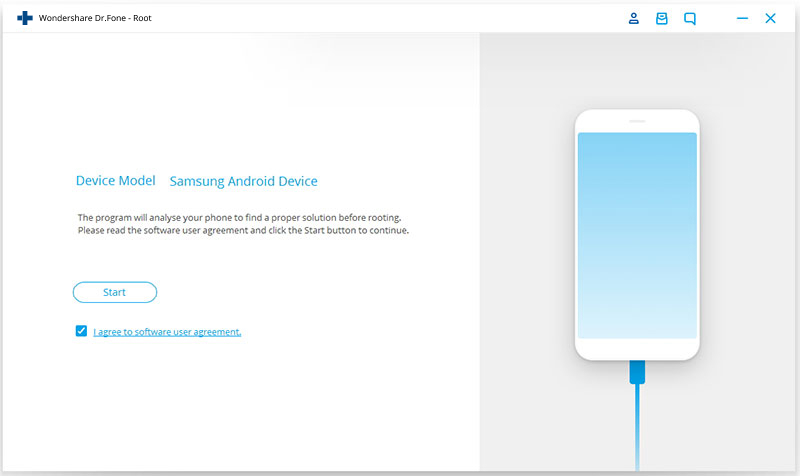 Here in this section we have brought to you an easiest step-by-step guide to root your Android device using dr.fone -Root on your PC. Step 1:	Download and install dr.fone on your PC. Download the software for free. Install it on your PC, once download process is complete. Next, with the help of a USB cable connect your computer and Android device. Ensure to establish proper connection. Now, it’s time to launch the software on the PC and hit "Root" from the main-screen of the dr.fone toolkit window. Step 2:	Detect and root your device. 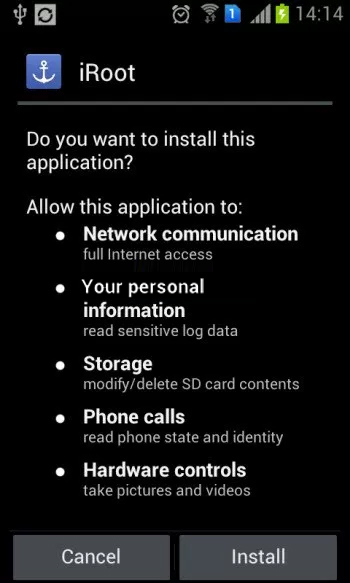 Once you launch dr.fone and as soon as you click ‘Root’, a pop-up window will appear on your Android device to ask you for permission. Click ‘OK’ to allow ‘USB debugging’, and hit 'Start' button after tapping on the ‘user agreement’ checkbox. 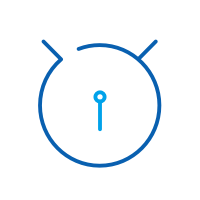 The program will then initiate to detect the device information and a compatible rooting package for your device. As soon as the software detects your Android device information and package, it is ready to start the rooting process. Now, all you have to do is, click ‘Root Now’ in order to continue the rooting process. Step 4: Confirm your actions. Lastly, you have to click on the ‘Confirm’ button on the pop-up window to confirm your actions. Within a short span the rooting process will be completed and your Android device is all set to get customized as per your needs. 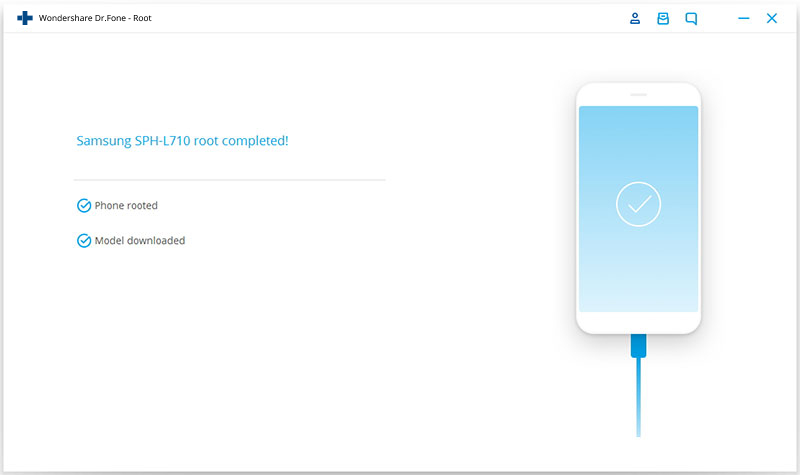 To root your Android device with iRoot APK, you need to download the device compatible version. It is pretty easy to download iRoot APK on your Android phone. You can search it on the web and download it to your computer. Later transfer it to your Android phone. Once the download gets over you have to prepare your Android device to install this APK file. As we know, most devices prevent software applications from unknown sources for security reasons. So, you need to allow the installation by enabling ‘Unknown Sources’ option in your device. Here are the steps to enable the installation of iRoot APK. Step	1:	Get into the ‘Settings’ app of your device. Step	2:	Scroll down the menu to ‘Security’ and hit it. Step 3:	Now, look for ‘Unknown Sources’ section and then enable it, if it is not enabled already. 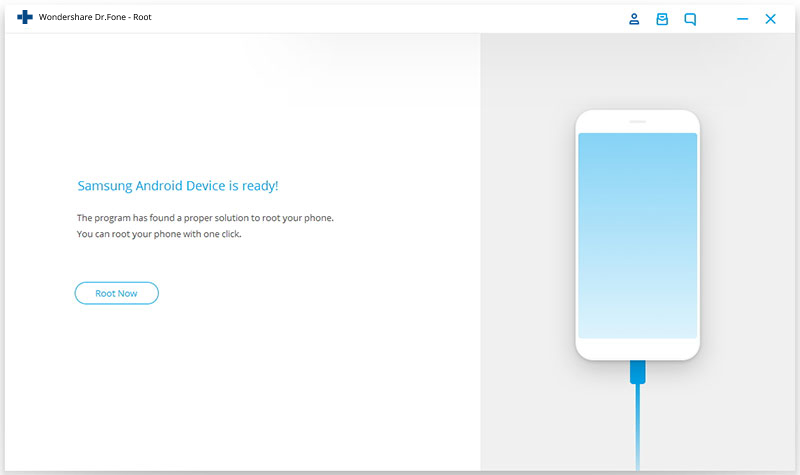 Step	4:	Lastly, locate the iRoot APK on your Android device storage, launch the app and click on ‘Install’. In case you face any warning message that blocks installation, click ‘More’ and ‘Install Anyway’. It will install the iRoot tool in your device. Step 1:	Once the iRoot APK is installed in your Android Phone, launch it to initiate rooting. Step 2:	The main screen of iRoot will display the license agreement. Accept the agreement by tapping on ‘I Agree’. Step 3:	Now, hit the ‘Root Now’ button from the main screen of iRoot App. It will start the rooting process. Step 4:	Once the rooting process is complete, check for 'Kinguser' App in your mobile phone's app drawer. If it is there that means your device has been successfully rooted. In this article we will learn ways of rooting HTC Desire 510 both with and without PC.